It's been my habit to read through the Psalms - usually one Psalm each day. the freedom with which the writers expressed their hearts to God. One Psalm I've read and re-read recently is Psalm 34. It speaks of determination, trust, praise, despair, hope, petition and resolve. As you read this familiar Psalm, make it your heart's expression to God. I will praise the Lord no matter what happens. I will constantly speak of His glories and grace. I will boast of all His kindness to me. Let all who are discouraged take heart. Let us praise the Lord together, and exalt His name. For I cried to Him and He answered me! He freed me from all my fears. Others too were radiant at what He did for them. Theirs was no downcast look of rejection! For the angel of the Lord guards and rescues all who reverence Him. Oh, put God to the test and see how kind He is! See for yourself the way His mercies shower down on all who trust in Him. If you belong to the Lord, reverence Him; for everyone who does this has everything he needs. Even strong young lions sometimes go hungry, but those of us who reverence the Lord will never lack any good thing. and let me teach you the importance of trusting and fearing the Lord. Do you want a long, good life? Then watch your tongue! Keep your lips from lying. Turn from all known sin and spend your time in doing good. Try to live in peace with everyone; work hard at it. and He gives attention when they cry to Him. But the Lord has made up His mind to wipe out even the memory of evil men from the earth. Yes the Lord hears the good man when he calls to Him for help, and saves him out of all his troubles. He rescues those who are humbly sorry for their sins. The good man does not escape all troubles - he has them too. But the Lord helps him in each and every one. God even protects him from accidents. Calamity will surely overtake the wicked; heavy penalties are meted out to those who hate the good. everyone who takes refuge in Him will be freely pardoned. Good Saturday to all of you. Today in my kitchen I wanted to share one of my favorite ways to make a meal. One pot meals are quick and economical and can be real tasty. The clean-up is simple, too. This week in preparation for my post today I made two one pot meals. 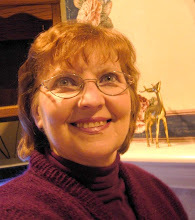 One was a lasagna pot meal that I saw on My Mother's Apron Strings blog. With that idea tucked in my head I came up with this one pot chicken enchilada meal. Another great thing about this recipe using these ingredients is that it is Gluten Free! 1 - 15 ounce can of pinto beans drained. 10 count package of white or yellow corn tortillas sliced. Use a stove top 4 quart or larger dutch oven to heat the oil. Add the chicken, salt, pepper, onion powder, garlic powder, oregano, green chilies and jalapenos (if using). Cook until the chicken is no longer pink. Remove the chicken mixture to a plate. Now it's time to layer the ingredients. Add to the same dutch oven 1/3 of the enchilada sauce. Place one third of the cut up corn tortillas evenly on top. Put 1/2 the chicken mixture on top of tortillas. Place 1/2 the queso cheese on top. Add all the beans on top of the queso. Add another layer of the tortillas. 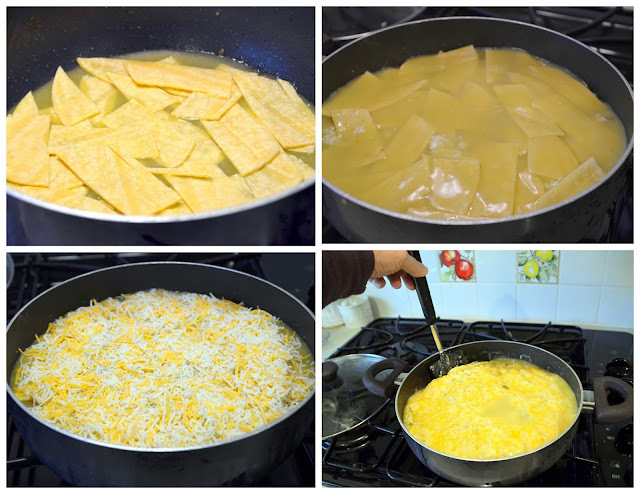 Add the second 1/2 of the queso cheese on top. Add the next 1/3 of the sauce. Add the second half of the chicken. Place the last portion of tortillas on top of the chicken. Pour the last 1/3 of the enchilada sauce on top. Sprinkle the top with the Mexican blend grated cheese. Cover and cook on medium low for up to 30 minutes. After about 15 minutes use a turner to gently slide down all around the edges to lift up the bottom portion so the bottom doesn't burn or stick. After the 20-30 minutes of cooking take lid off and let it cook off some liquid for 5 minutes longer. You just want the ingredients to be heated through and for the cheese to melt nicely. Serve with a salad or veggies. This can serve 4 to 6 people. I didn't get photos of all the layers but these are the first layer and the middle layer and the last topping of the Mexican blend of cheese. The last photo shows the spatula going down the edges of the pan all around to lift the bottom layer gently. 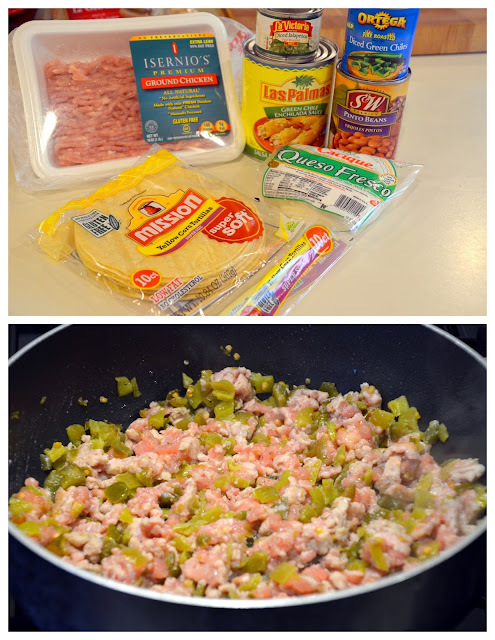 My family really enjoyed this dish with the jalapenos but it did add some good kick to it so if your family is sensitive to spicy meals just delete the jalapenos. They also enjoyed tortilla chips on the side. For flashback Friday I'm bringing back these maple toast eggs, they are a nice change for breakfast, it's a one egg breakfast in a muffin cup. In skillet cook bacon till crisp, place on paper towels to absorb grease, then dice and set aside. In small saucepan heat syrup and butter until butter is melted. Trim crusts from bread, flatten slices with a rolling pin. Brush one side generously with syrup mixture and press each slice into a lightly greased muffin cup with syrup side down. Divide diced bacon among muffin cups. Carefully break one egg into each cup. Bake in a 400º oven for 18 to 20 minutes or until the eggs are done. I baked them for 22 minutes. Serve immediately, I had a little syrup mixture leftover so I drizzled it over the eggs. Here is a gravy that pairs perfectly with Salisbury steak, meatballs or schnitzel. And one can never go wrong by smothering mashed potatoes with a spoonful of onion gravy! Cook onion in oil in a heavy skillet over medium heat, until onion is softened and browned, about 10-15 minutes. Add minced garlic and saute for another minute or two. Sprinkle flour over the onions and continue to cook, stirring, for several minutes. Gradually stir in broth, Worcestershire sauce, and pepper. Simmer (stirring often) until gravy is slightly thickened. Pizza is really just an experiment of combinations. I had a jar of roasted red and yellow peppers and a jar of marinaded artichokes that looked like a good start. I found some pitted Kalamata olives and feta in my refrigerator. The base for my experiment was a herb and Parmesan flavoured crust, spread with a garlic infused mayo. Let's begin with the crust. This recipe makes 2 12" pizza crusts. The dough can be made, risen once and then divided and remaining dough can stay in refrigerator well sealed for up to 5 days, or frozen for up to 6 weeks. To use from frozen, thaw in refrigerator. Allow cold dough to come to room temperature before using. Place warm water in a bowl. Stir in sugar and sprinkle with yeast. Allow to stand without stirring for 10 minutes. While yeast is proofing, stir together flours, salt, seasoning and cheese. Stir yeast mixture and pour over dry ingredients, and add 3 tablespoons of the oil. Stir until dough begins to come together. Using hands pull dough into ball, adding extra oil if needed. Knead on a lightly floured board for about 3 minutes. Dough will be smooth and not sticky. Place in a well grease bowl. Cover lightly and allow to rise for 45 minutes to and hour. Begin by grilling or baking chicken. ( I rubbed the chicken breast with a bit of olive oil and sprinkled it with Greek seasoning, then grilled it. Fry bacon, drain fat and crumble. Once dough has risen, punch it down and divide it in two. Take one portion and roll it out and place it on a sheet of parchment paper sprinkled with corn meal. This will give the crust a nice crunch. Stir together mayonnaise, crushed garlic and Parmesan cheese. Spread over crust. Next place the cut up grilled chicken pieces, bacon. artichokes, roasted peppers, olives and top with remaining cheeses. Heat pizza stone to 475º-500º and lay pizza on stone. We bake ours in our Big Green Egg grill at 500º, but this can be baked on a hot stone in oven as well. Baking time will be approximately 15-18 minutes. 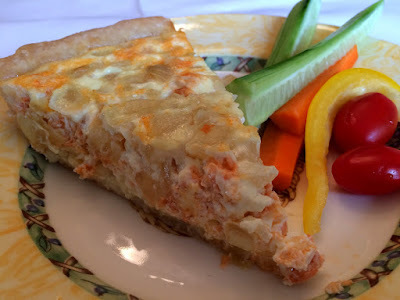 This Salmon Quiche is great the day it is made and is just as tasty reheated in the oven the next day. My mom in law makes this and I'm always happy to take home a few slices for our lunch the next day. You can use your favourite pastry recipe or purchase unbaked frozen pie shells to put this together in minutes. Line the unbaked frozen or fresh pie shell with heavy foil. Bake for 10 minutes. Remove foil and set crust aside. Fry onion in butter in a small fry pan. In a medium bowl, beat together, eggs and light cream. Add salt and fresh dill. Place salmon evenly over the bottom of the baked pie shell. Sprinkle with cheese. Pour egg and cream mixture over salmon and cheese. Reduce oven temperature to 375F and bake for 45 minutes or until knife comes out clean when tested in the center. 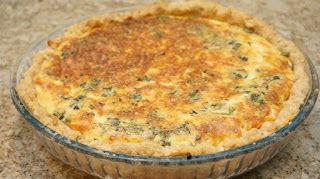 To reheat the next day, place individual pieces of quiche on a baking sheet and warm in 350F oven for 20 minutes. Maybe it's your turn to take snacks to the office, you're planning appies for a dinner or have been asked to contribute food to a baby shower. These Zucchini toasts are quick and easy to prepare. You can use any type of tiny bread slices you like, prepare your topping ahead and quickly put them into the oven for 10 minutes just before serving. Spread by rounded teaspoon on each slice of bread. If you haven't heard this song before go to u-tube and listen to these touching words. I was asked to bring a quiche to a birthday brunch recently. it turned out a bit watery so this time I wanted to avoid that if I could. I did a bit of research online and decided to share what I learned with you. 1. Freeze the crust for at least 30 minutes before baking. Once your crust is rolled out and placed in the pan. Put it in the freezer for at least 30 minutes. (Use a metal pan or a tempered glass one that can go from freezer to oven without breaking.) 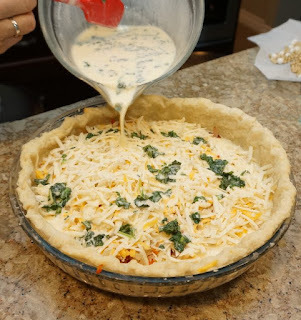 While the crust is in the freezer, you can prepare the ingredients for your filling. 2. Blind bake the crust. Blind Baking means baking it before filling it. 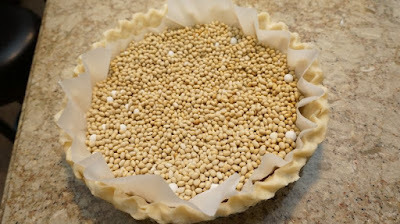 Carefully line the unbaked crust with parchment paper and then fill with beans or pie weights, making sure the weights go to the edges. This ensures that crust edges will not slide down into the middle as it bakes. Bake the crust at 350º for about 20 minutes with the weights in it, then remove the parchment paper and weights and continue to bake until the crust begins to turn colour. Remove from oven and fill. 3. Make sure all your filling ingredients are fairly dry. This means frying mushrooms until the liquid evaporates, wilting spinach and blotting it with paper towel to get the excess moisture out, and pre frying bacon, sausage or proscuitto. 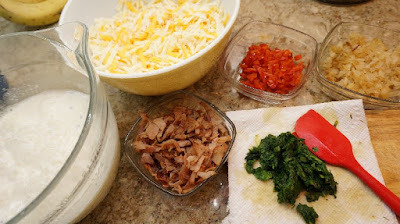 For the quiche in the pictures, I used sauteed onions, red peppers, spinach and proscuitto. 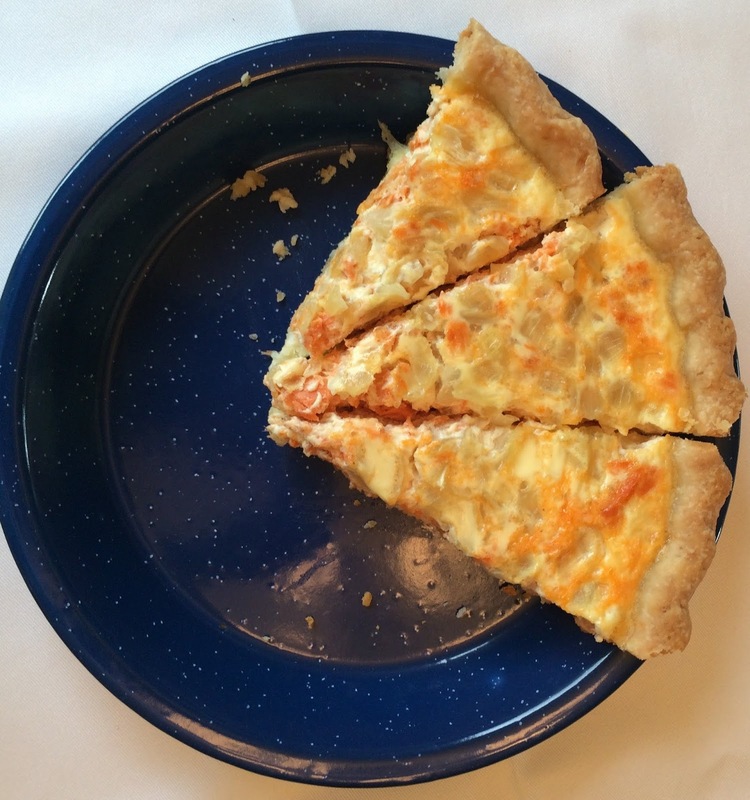 A rule of thumb here is to use about 1 1/2- 2 cups cheese for a 10" pie plate. 5. Eggs to milk ratio. I found that using 2 large eggs to 1 cup of milk works well. For a 10" pie plate I used 4 eggs, 1 1/2 cups milk and 1/2 cup heavy cream. I also like to add a tablespoon or so of Worcestershire sauce to give it an extra punch of flavour. 6. Bake the quiche at 350º for about 35-40 minutes. Don't over bake it. It should still be a tiny bit wobbly in the middle and a knife tip inserted into the middle should be clean with just a bit of moisture. Let the baked quiche sit for about 10-15 minutes before slicing and serving to give it time to set. I found these tips helped a lot and I had a nice silky filling with no watery residue. 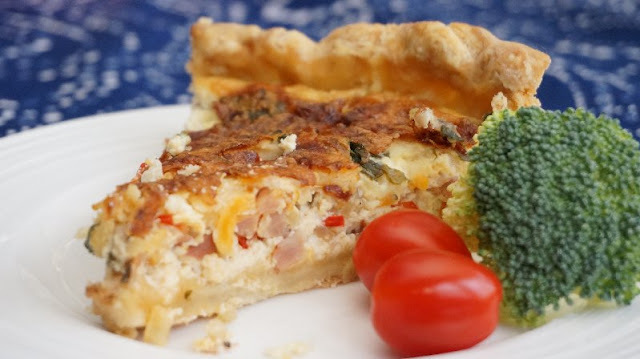 Quiche remains a brunch favourite and I hope that keeping these tips in mind will improve your quiche skills. For today's Flashback Friday I'm going back to this Betty Crocker Danish pastry I posted seven years ago. It's a recipe that might takes many of us back to when we first started baking and became one of my favorites at a bridal shower in 1975. People have asked what kind of a filling it has and are always surprised that it has none and that, if fact, the pastry has no sugar in it. Cut 1/2 c butter into 1 cup flour. Sprinkle 2 Tbsp water over mixture and stir with fork. Round into a ball and divide in half. On ungreased cookie sheet, pat each half into a strip, 12 x 2 1/2 inches, about 3 inches apart. In small - medium saucepan, heat 1/2 c butter and 1 c water to rolling boil. Remove from heat and quickly stir in almond extract and 1 c flour. Stir vigorously over low heat until mixture forms a ball. Remove from heat. Beat in eggs, one at a time, until smooth. At first it will have a slippery texture as you stir, but keep on stirring until each egg is incorporated to make a smooth pastry. Drop by Tbsp on top of strips and then spread evenly, using a wet knife, to cover strips completely, sides included. Bake at 350 F for 60 - 65 min. When you take them out of the oven they will look like funny shaped , flopped French bread. Cool completely. Frost and sprinkle with toasted almonds. Store uncovered or lightly covered with wax paper (room temp) to keep crisp. Can be frozen. Frosting: Mix icing sugar, (confectioners sugar), soft butter, almond extract and 1 – 2 Tbsp warm water until smooth and easy to spread with a spoon. I saw these chicken rolls using Pillsbury Crescent Refrigerator Dough Sheets and had to give them a try. I didn't realize that the Crescent dough was sold in sheets that aren't perforated. It makes this recipe a lot simpler as I purchased the basic crescent rolls and had to pinch all the perforations! Buy the sheets if you want to make this tasty dish. Prepare a 9 inch round pan with cooking spray. Mix together the chicken, ranch dressing and cheese in a small bowl. Unroll the dough sheet onto a large cutting board. Spread the chicken mixture evenly on top of the dough leaving one inch at one end of the long side uncovered. 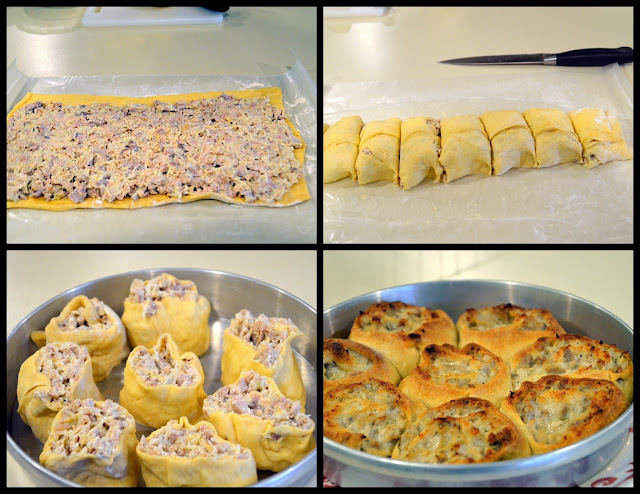 Roll the dough with the filling carefully toward the uncovered edge. Pinch the seam when you have it rolled. With a sharp knife cut 8 equal parts. Place the 8 rolls carefully into the prepared pan. 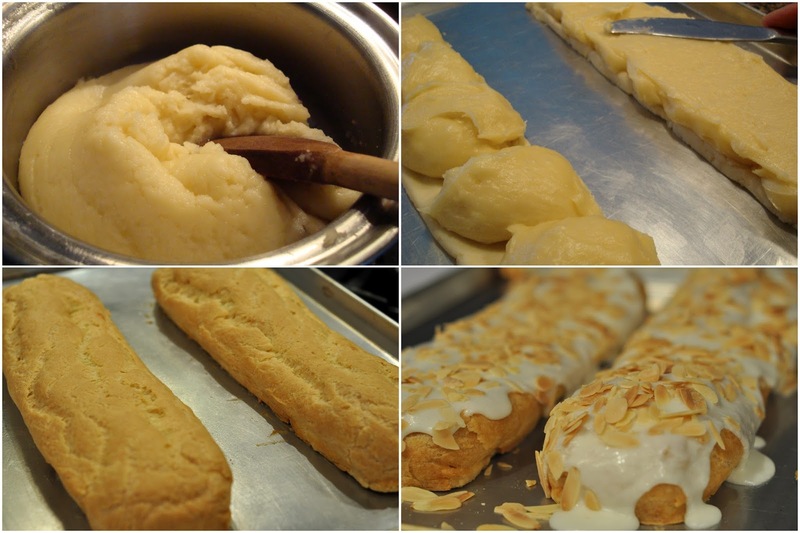 Bake for 18-22 minutes until the the dough is golden brown. Cool in pan for a few minutes. Top with the green onions and serve with side of your choice. We recently had a salad similar to this at a restaurant. The combination of flavours was unusual I thought, and made for a bright and delicious salad. - I've not included amounts for the ingredients as it will depend on the number of people you are serving. 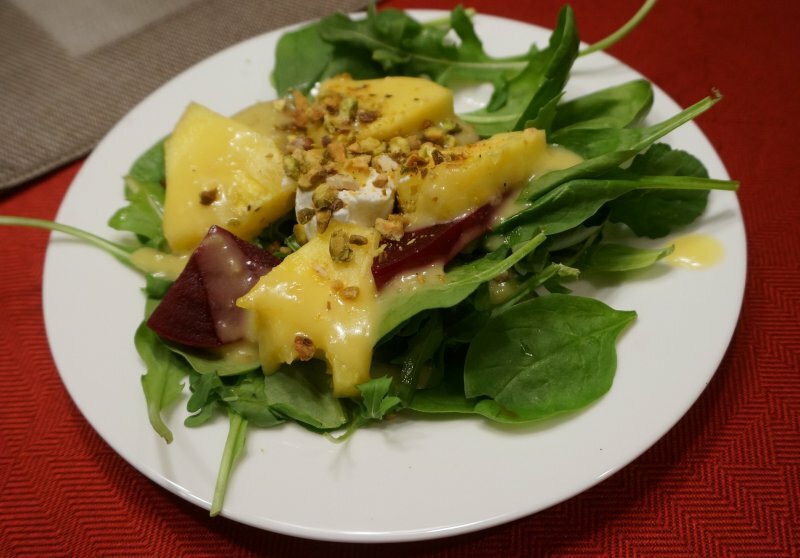 - I like to plate this salad rather than serving it in a salad bowl because the beets will discolour the pineapple..
- You'll want the beet and pineapple pieces roughly the same size so if your beets are large, cut each slice into 4 and cut the pineapple pieces into quarters as well. - The dressing can be changed up depending on what kind of balsamic vinegar you have on hand. Roasted or boiled beets sliced 1/2" thick. Mix dressing before making salad. Set aside. Combine vinegar, shallots, mustard, honey and seasonings in a salad dressing shaker or a small bowl. Shake or use a whisk to blend well. Slowly add oil, shaking/whisking after each addition until the oil is emulsified and the dressing is cloudy. Mix baby spinach and arugula making a bed of greens. Alternately lay pineapple and beet pieces in a circle on the greens. Drizzle dressing over each salad and serve. Cornbread is one of those side dishes that I think about when we have chili. It is also delicious with soup or as a dessert with butter and honey. Now that I often cook for two again, it is fun to use this small cast iron pan I received as a gift from a friend. You can double the recipe to make it in a large cast iron, regular loaf pan or 9 x 9 baking pan. Preheat oven to 350 F and grease pan well. Combine dry ingredients in mixing bowl. In a small bowl beat eggs with fork, add in the oil and buttermilk to combine. Add liquids to dry ingredients and stir until blended in well. Spread into prepared pan and bake 25 - 30 minutes. We have enjoyed this Thai dish several times over the past few months. I think you will too! Cook pasta in large pot of boiling salted water until tender but still firm to bite. Drain. Transfer pasta to large bowl; add 2 tablespoons sesame oil and toss to coat. Heat remaining 2 tablespoon oil in heavy large skillet over medium heat. Stir fry chicken pieces and remove to separate plate. Add green onions, garlic, and ginger and red peppers; saute until red peppers soften, about 2 minutes. Add honey, peanut butter, soy sauce, vinegar, chicken broth and pepper flakes; whisk to blend. Simmer sauce for several minutes. Pour over pasta and toss to coat. Transfer to platter; sprinkle with remaining green onions. ". . . then choose for yourselves this day whom you will serve, whether the gods your ancestors served beyond the Euphrates, or the gods of the Amorites, in whose land you are living. But as for me and my household, we will serve the LORD." I recently finished reading through the Old Testament books of Kings, giving a chronological order of the kings of Judah and Israel and a bit of their life. One thing that stood out when I read these chapters is how time after time it says something like, " Jehoahaz, son of Ahaziah king of Israel, became king (and) he did evil in the sight of the Lord." Sometimes it refers to "evil just like his father had done". Once in a while, a king such as Joash is listed of whom it says, " He did what was right in the eyes of the Lord." These thoughts have reminded me how each generation chooses the way they will go for themselves. God has given us all a free choice in this. King Josiah was eight years old when he became king and had no upbringing in the Law, However, he made a bold move to get rid of idol worship and renew God's covenant with the people. My prayer is that, as grandparents and parents, we will choose to serve the Lord and never give up praying for the generations to follow. Unlike the people in Old Testament times, we have the Bible to show us the result of disobedience and rebellion. We stand on this side of the cross, God's story of forgiveness and we have the Holy Spirit to guide us. Let us take our stand with Joshua to serve the Lord. 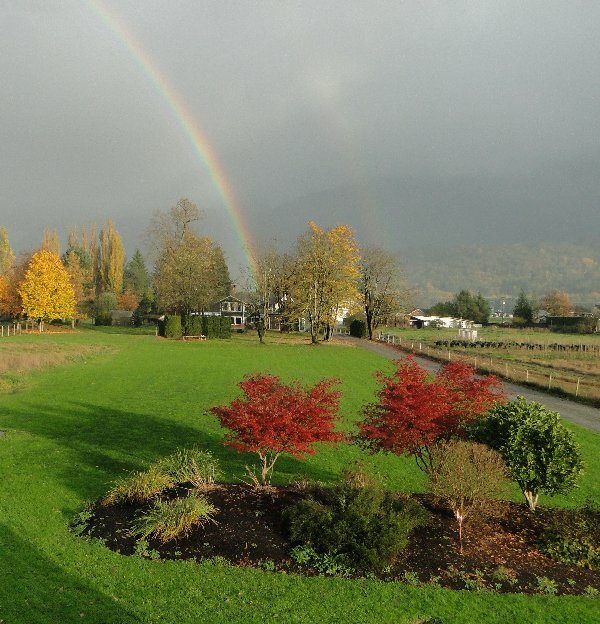 It is January... a month that brings to mind warm fireplaces, afghans and sweaters. But sometimes warming our bodies is not enough, our hearts feel a chill and nothing warms the heart like sentimental thoughts. I am perhaps more sentimental than most - and the sentimental attachment I have to many of the things in my home keep me from 'decluttering'. One of my recent additions to my sentimental 'heart warmers' is the above gift from my dear friend, Judy. She came over one afternoon so I could do her a sewing favor. Knowing monetary thanks would be refused she found a way to reciprocate. She brought me a gift. A beautifully wrapped box of herbal tea and a unique tea cup set. 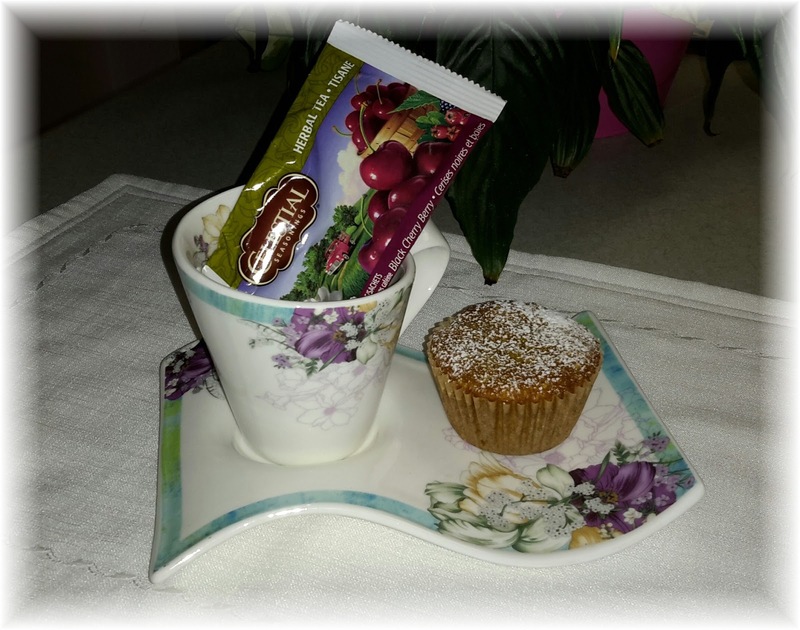 I love the curves of this delicate cup and tray and of course it is in my favorite colors. When I need a heart warming, I can make myself a cup of tea and sit for a few moments reliving the happy memory of the afternoon Judy and I shared. The Sunshine Muffins, pictured above, were warm out of the oven and the coffee freshly made when my friend came. The recipe is a long time favorite of mine that I have adapted to be gluten free. I love them because they are so quick and easy to make - don't take long to eat either ! Mix dry ingredients and add to liquids and mix until smooth. Note - Sentimental is defined as "expressive of or appealing to sentiment, especially the tender emotions and feelings of love, pity, or nostalgia"
How sentimental are you ? What stirs your sentimental feelings? There's nothing more comforting on a cold winter night then to come home to a fresh hot bowl of cooked spagetti sauce dished over capelline noodles. I live opposite a green house and I am so fortunate that my neighbor lady supplies me with many fresh tomatoes all summer and I just throw them in a bag to freeze and make spaghetti sauce in the winter when I have more time. For this weeks flashback Friday I paired it together with Capelline noodles (angel hair) and also added Char's fresh roasted beans. 1/4 - 1/2 Cup grated fresh Parmesan cheese. Brown ground beef, seasoning slightly with salt and pepper. Drain. Place all ingredients except cheese in large sauce pan and bring to a boil. Turn heat to medium and cook until sauce is thick - about 11/2 hours - 2 hours. This sauce freezes well. I often double it and freeze half. 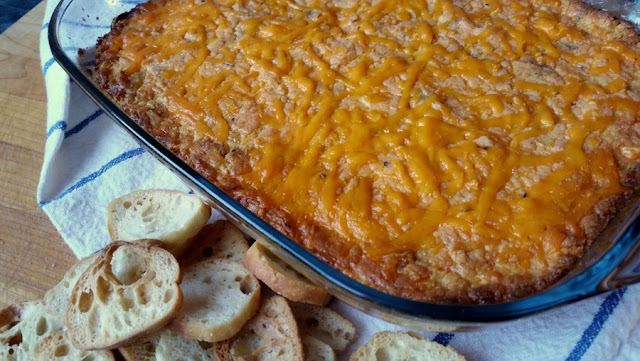 Dips and spreads are delicious anytime but especially nice to serve on game nights. Serve them with crackers, multigrain or corn chips. This dip has a bit of spicy heat to it, feel free to adjust the hot sauce according to your taste. In a bowl, whisk together cream cheese, sour cream, and hot sauce until smooth. Stir in salad dressing, chicken, and 1 cup of cheddar cheese. Spread into a 9" x 13" greased baking pan. Sprinkle remaining 1/2 cup cheese over top. Bake in a 350º oven for 35 minutes. This was a go to meal for my family when our kids were young. I added a couple steps to deepen the flavor from my original easy Tuna Noodle. Boil noodles in salted water. While noodles are cooking saute celery and onion in the oil and butter till onions are translucent. Add tuna, soup, and milk to the pan and heat through to bubbling. Drain the noodles when al dente. Mix the noodles with the bubbling ingredients. I served them with jalapeno chips, too, for some added kick. The humble potato brought to the next level. 1 tablespoon bacon bits, per potato, plus extra if you are a bacon lover to add to the topping with the cheese. Wash potatoes and make a little slit through the skin of each one in 3-4 places. Rub outside of potatoes with a little bit of olive oil and sprinkle lightly with garlic salt and pepper. Place in a baking dish and bake potatoes at 375º for 1 hour or until tender. The skins should turn nice and crisp. Remove from oven and allow to cool for about 10 minutes. Slice each potato open lengthwise. 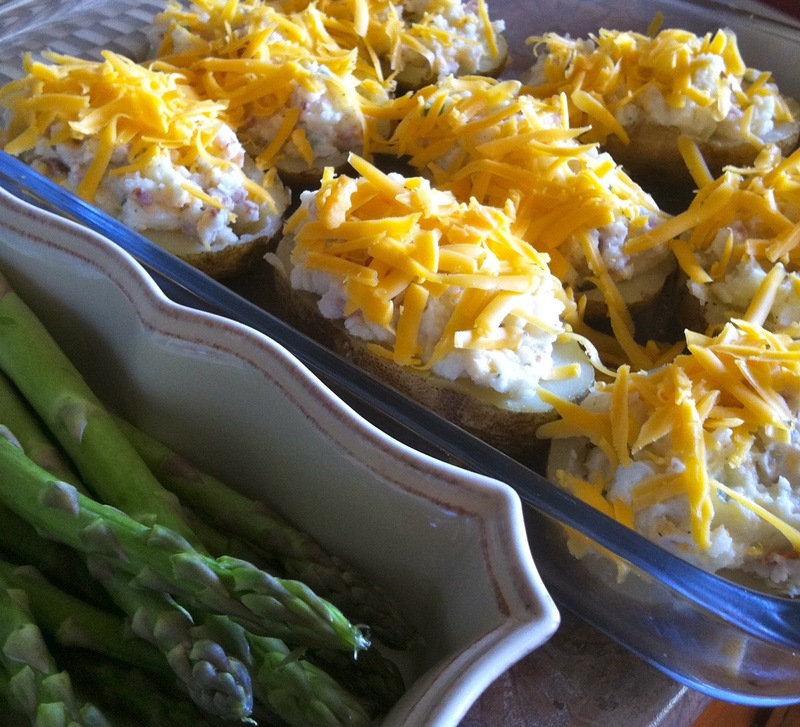 Scoop baked flesh of potatoes into a bowl and add the remaining ingredients except for the cheddar cheese. Mash mixture together and refill the potato skins. Top with cheddar...and the extra bacon if using. Place back in oven and bake for 15-20 minutes. You can bake ahead of time and assemble. Baking time will be a little longer once stuffed as the filling will be completely cooled off. When the orchard apples were first available in fall, I purchased a large bag of my favorite apples for baking. I've been using them up in various recipes and this is one of them. We really like this syrup on apple pancakes. 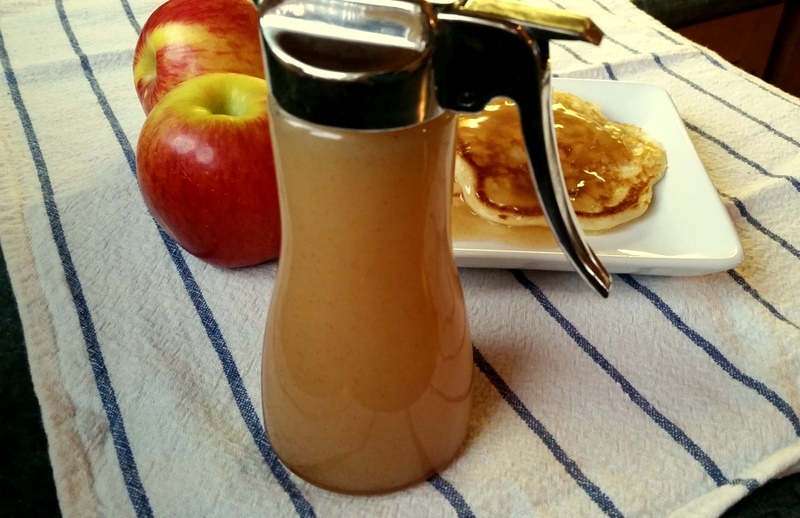 Dipping slices of apples in this syrup is really tasty as well. In a small saucepan, combine sugar, cornstarch, and cinnamon. Whisk in apple juice until mixture is smooth. Cook over medium heat for 5 minutes or until bubbly and thickened. Stir in lemon juice and butter. The New Year has just begun. A few tracks have been made. Sometimes we get to choose the kind of tracks we make and where they go. These words, 'Be Still' will be my 'go to' verse for this year. I know that I am wired for anything than stillness. When I face challenges and set backs, my first inclination is to fix it. No one hears. Can there be a God? The Hebrew language suggests that it means to abandon, to slacken, to let go. sit at the edge of a bedside saying goodbye to a dear friend. I clenched her hand....and my eyes filled with tears. I whispered a few encouraging thoughts. Its hard to grasp that God is infinite during those solemn moments. She whispered, "It's time to let go...."
I knew what those words meant or did I? How can one "Let Go?" reflected over the words...."Be Still"
God is God and we are to rest that he is in control over our lives. Teach me to be quiet before God and enjoy a calm confidence. Hours later she passed away peacefully. but let me stand with confidence that I know who 'He' is. Only God can provide calm for the future. What does a cold wintry day call for but a good bowl of soup? This soup is 'naturally' gluten free. I was invited to my friend, Dorothy's house for lunch some months ago and she served me a lovely tomato soup. 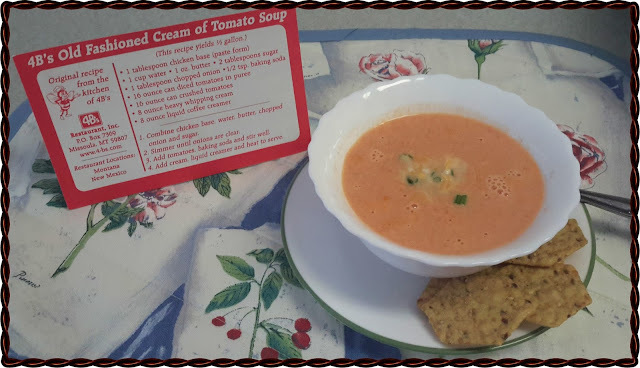 I had not had tomato soup for a long time and found her's so tasty, I asked her for the recipe. 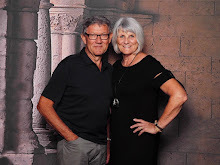 She told me that years ago she and her husband had been travelling and stopped in a town they were not familiar with and asked someone for a good place to have lunch. They were told that they had to go to 4B's because they were known for their excellent tomato soup. They took the advice and did enjoy the soup, so much that Dorothy asked for the recipe. Contrary to many restaurants that refuse to share their recipes, this place was so happy to share, that they had pre-printed recipe cards for those who asked. This restaurant is closed now, but my friend still had an original card and was happy to give it to me - the one pictured in the above photo. Add tomatoes, baking soda and stir well. Add cream, milk and heat to serve. 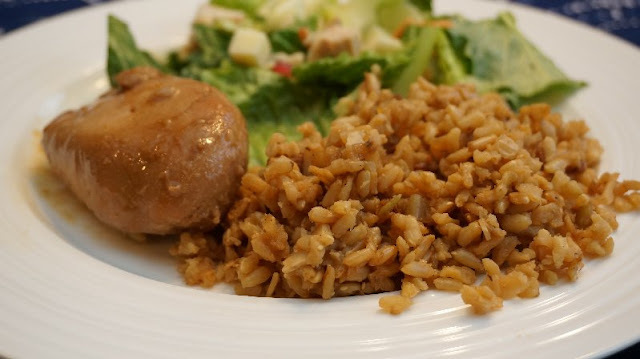 Serve with crackers and a salad - and you have a meal that satisfies. I first posted this recipe in 2013 and I thought I would share it again for a cold winter night quick dinner idea. I loved reading the ideas from our readers and think that maybe there might be other memories of the way mom's used to bring comfort food to the table. I would have never thought to put this recipe on the blog except that my beloved said it should go on since it is one of his favorites and maybe not everybody knows how to make creamy gravy from fried sausage. My mom often made this quick meal and I don't think I ever truly appreciated how delicious it was when I was small. Now...it has joined the ranks as a true comfort food in our home. Somehow, dill pickles are a must on the table and I often make coleslaw that has grated carrots and shredded red cabbage to add color to the plate. Slice sausage into 1/4 inch coins and fry in a large flat bottomed fry pan stirring occasionally to brown both sides. Do not use a non stick pan or the sausage will not brown as it should and you want browned bits to stick to the pan. Remove sausage and keep warm in oven while you make the sauce. Cook macaroni according to instructions on the box. Drain. Add flour to the drippings in the fry pan, scraping bottom to remove browned bits and stir to combine over medium heat. Cook and stir until the mixture becomes thick and stir for 1 minute to cook the flour well. Add the milk a little bit at a time at first, stirring to create a sauce. Add 2 cups milk and then additional milk to make medium sauce. Taste and season with salt and pepper. Add macaroni to the pan and stir to warm up macaroni. 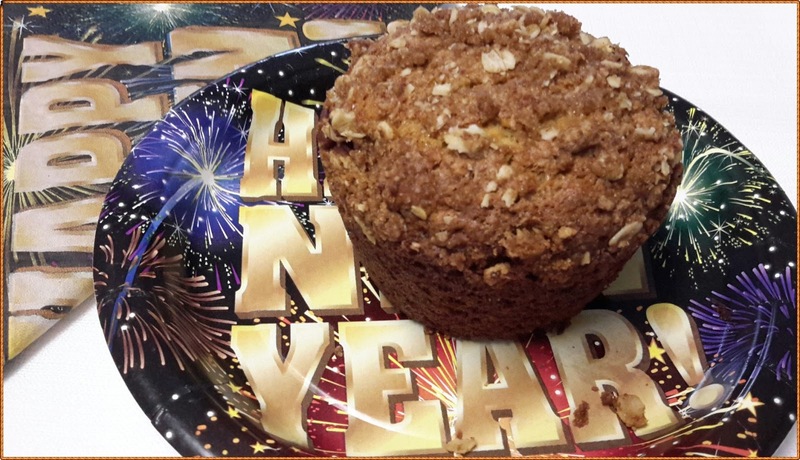 My favorite banana muffin recipe is this one, It came about because I had a couple of too ripe bananas and hated to throw them out and I was suddenly hungry for banana muffins... Maybe you are too ! Place eggs, banana , melted butter in mixer bowl and beat until perfectly smooth. Spoon into greased or paper cup lined muffin tins and sprinkle the crumb mixture over the tops. These muffins rise beautifully, have a really nice texture and flavor. They keep well for a couple of days on counter or freeze well for future use. This recipe makes 6 super large muffins or 12 regular sized muffins. There's nothing quite like homemade chicken noodle soup to cure whatever may ail you. (And it seems that in January there are many who are 'ailing'!) If the thought of cooking up stock and making your own noodles is a little daunting, here's a short-cut recipe that is delicious and doesn't take long to cook up! Remove the meat from the rotisserie chicken; cut into bite size pieces and set aside. Heat oil in a large stock pot over medium heat. Add the onions, celery, and carrots, and saute until onions begin to turn translucent. Add garlic and saute for another minute or so. Pour the 10 cups chicken stock into the stock pot. Add bay leaf, star anise and parsley and simmer over medium-high heat for about 30 minutes. Meanwhile, cook noodles in a separate pot according to directions...being sure not to overcook. Drain. Add chicken pieces and noodles to the soup pot. Test and adjust seasonings as needed. Heat through and serve. *star anise is optional, but gives a wonderful exotic flavour to the soup. A friend recently served it to us alongside a pork chop dish and I was glad to be reminded of it. It has a nice nutty flavour and is baked in the oven so that last minute preparation is avoided. Cook bacon in a large frying pan until crisp. Drain and reserve 3 Tablespoons drippings. Crumble bacon and set aside. Saute onion and celery in drippings until tender, but not brown. If you are not using bacon, use 1-2 tablespoons of oil instead of the drippings. Stir in remaining ingredients and reserved bacon. Cover and bake at 325º for one hour or until liquid is all absorbed. With the kids back at school after the holidays, it's a good day to put a simple drop cookie into the freezer for those lunches. I love this gingersnap that has oatmeal and walnuts added in for texture and nutritional value. It's a recipe that gets repeated requests at our home. It's a big batch making about 100 cookies so there is plenty for the freezer and some to share. Cream together butter and sugar with a stand mixer until light. Add in eggs, one at a time and then molasses. Beat together to combine. Stir together dry ingredients and then slowly add to creamed mixture. Cover and refrigerate 1 hour to make handling the dough easier. Use a small spring loaded ice cream scoop or form small 1 inch balls. Roll balls into sugar and arrange on greased cookie sheets about 2 inches apart. They will flatten so there is no need to press them down. Bake for 10 minutes or until lightly browned and cool on wire racks. The calendar page is opened to a fresh new start. 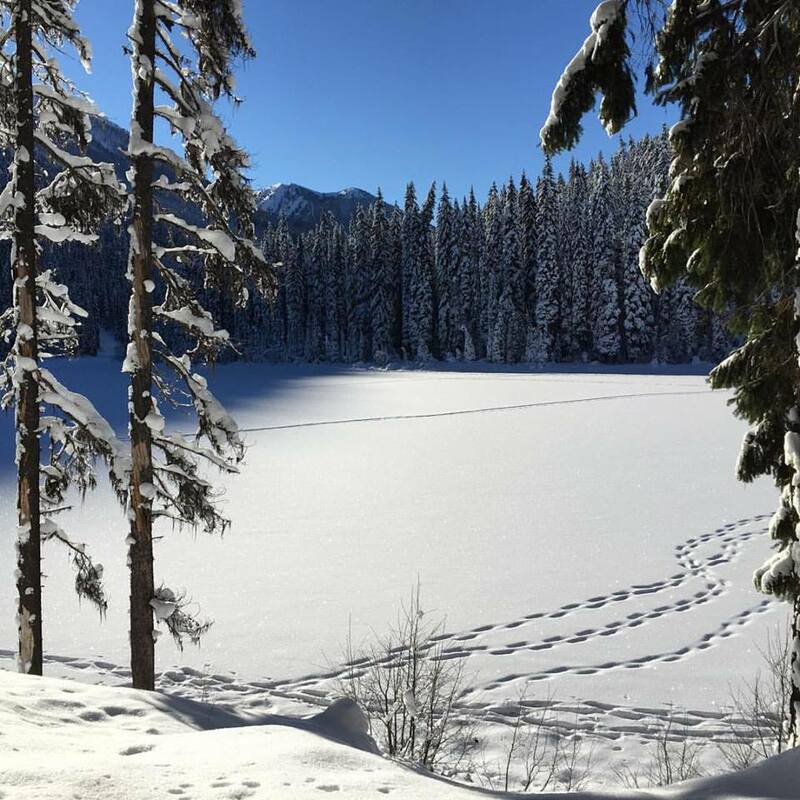 Hello 2016! Whether you have stopped by for the first time or are a long time friend of ours here at MGCC we want to thank you for visiting our blog. Many of you have supported our projects this past year by purchasing our cookbooks. We are grateful for our sponsors (visit them on our sidebar) who play a vital part through their generous giving. We look forward to what God has in store for us as we journey together in 2016. We want to start out the first weekend of this new year with food for thought followed by a traditional recipe for New Years Cookies, better known in our Mennonite circles as Portzelky. 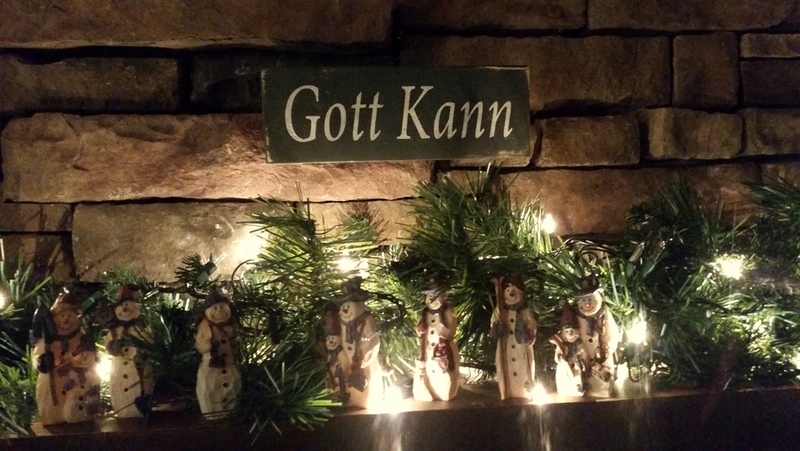 Each year when we gather around the Christmas table my husband Scot has something to encourage and challenge us with for the coming year. In light of giving, he found a list of 5 gifts that don't cost, but may require personal sacrifice. From youngest to oldest this list spurred on some good suggestions of how we can be generous givers of these free gifts. Join us as we seek to make a difference. Encouragement. Seize the opportunity to reach out to others with words of affirmation, and acts of kindness. 1 Thess. 5:14 includes a challenge. "...encourage the fainthearted, help the weak, be patient with them all. Give a listening ear. "Let every person be quick to hear, slow to speak...." Those wise words come from James 1:19. Heeding them can provide an incredible gift. Time. 1Peter 4:10-11 encourages us to use our God given gifts, ultimately that God may be glorified. Everything we do requires time. Whether serving your family a meal, helping with homework, cleaning, repairs, caring for the sick or the elderly. Make these a positive investment of your time. They may be life changing times for others and for you. listen and be generous and cheerful givers. I'll be making a few batches of Portzelky over the weekend to serve and deliver...fresh and warm. Typically these have raisins in them but for a change I've used dried cranberries. Before adding the cranberries I divided the dough into two bowls, added the cranberries to one and left the other plain....some like these little fritters better without the fruit. Place milk, water and butter in a microwave bowl and heat until very warm. Beat eggs and egg white together until frothy. Stirring continually pour very warm milk mixture over eggs until combined. In a large bowl, stir together sugar, salt, baking powder, yeast and 2 1/2 cups flour. Stir with a wooden spoon. Adding remaining 1 cup of flour. The dough will be a bit sticky, or 'shaggy'. Stir in fruit if using. Set aside and cover with a lint free towel to rise for 45 minutes or until double in bulk. Heat oil in deep fryer or on stove top to 375º. Always stay near hot oil on stove! Drop teaspoons of risen dough into hot oil. As the portselky cook they will usually flip over when cooked through on one side. You may have to turn them with a spoon. Remove with deep fryer basket or slotted spoon onto a paper towel lined baking sheet. If wanting to dust with sugar put choice of sugar in a large bowl and add portzelky and shake to coat. Or, place bowls of sugar on table for everyone to dust their own.